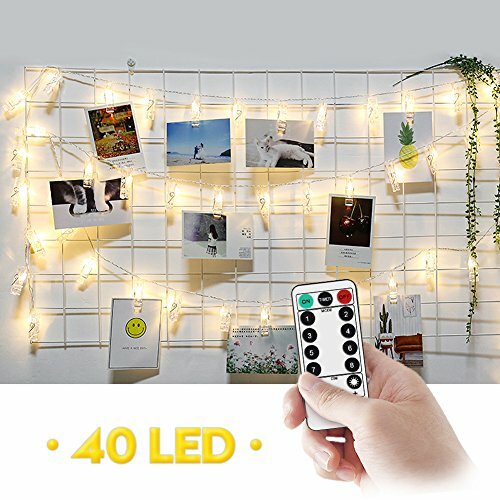 【DIMENSIONS】40 LED String Lights total length 5m; 30cm lead circuit; 12cm between 2 blubs. Create a photo wall for all happy memory to remind the great time. 【WATERPROOF BATTERY BOX】With ON / OFF feature and requires 3 AA batteries (Not Included). IP44 Waterproof. Can be used for both outdoor and indoor, so it can meet normal use outside. (Battery case can\'t soak in water). 【13-KEY REMOTE】Up to 8 lighting modes; ON/OFF buttons; Multi-level brightness adjustment; Timer mode (8 hours on and 16 hours off). 【IDEAL GIFT】It the Nice gift for the party decoration .you can install on most surfaces: wall, window, door, floor, ceiling, Christmas tree, etc. Perfect decoration for home, living room, car, wedding, Christmas, Valentine\'s Day and so on.